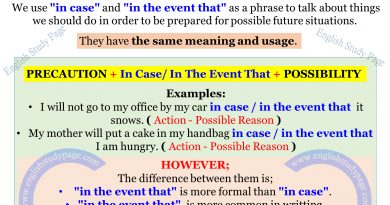 Simple Present Tense indicates an action which happens in the present, but it isn’t necessary for actions to happen right now. 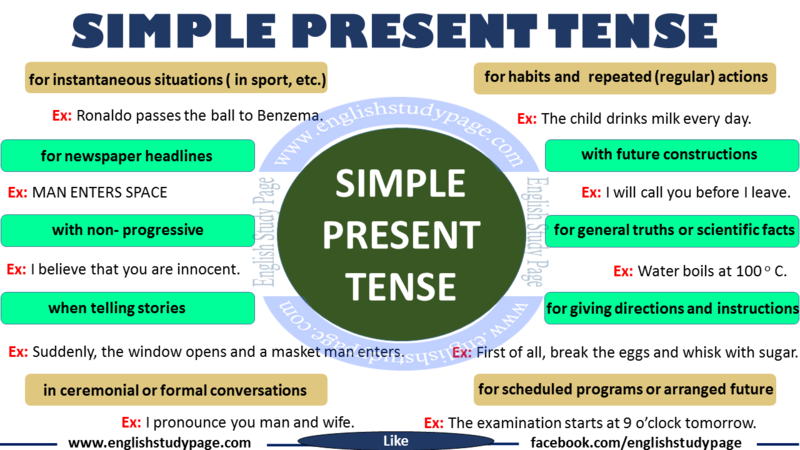 Simple present tense indicates, unchanging situations, general truths, scientific facts, habits, fixed arrangements and frequently occuring events. 1. 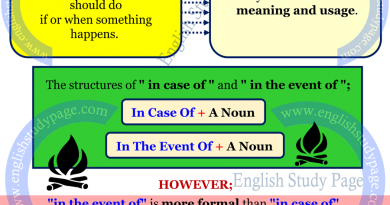 In Simple Present Tense, we add the suffix -s at the end of the verbs for the third singular subjects ( He, She, It ) . On the other hand, we use first forms of the verbs for other subjects ( I, You, We, You, They). 2. Although we add the suffix -s at the end of the verb for the third singular subjects in possitive sentences, We remove the suffix -s at the end of the verb in questions and negative sentences because of being used ‘does’ or ‘doesn’t’ as an auxillary verb. My mother doesn’t let go to the movies with my friends. Do you prefer your coffee black? The teacher shouts at us all the time. Do not ( Don’t ) you get tea? We use other question words ( Like Who, What, Why , How much / many, How often etc.) in present tense. Where do you wait for him every month? How often does he call you? 1. Simple Present Tense expresses habits and repeated (regular) actions. She gets up early in the mornings. The child drinks milk every day. I go to the school by servis car. Thomas always listens to slow musics. Nowadays, almost all of the children spend most of their day in front of television. Sarah usually comes to the work on foot. They never write letter to me. My mother always criticizes me. Do you like going to school every day ? I feed my fish every day at 8 o’clock in the morning. She doesn’t listen to the radio very much. We like spend time at home. He goes to the hospital for dialysis three days a week. Do you like getting up early on Sundays? 2. Present Tense expresses general truths or scientific facts. The sun does not turn around the Earth. Water boils at 100 o C.
Cats like playing with ball. It never snows in summer. Water freezes at zero centigrade degree. 3. Present Tense expresses scheduled programs or arranged future. The bus leaves at 08:00 am on Tuesdays. The examination starts at 9 o’clock tomorrow. The train leaves for Paris at 10:00 pm. The lesson starts at nine every day. The plane leaves at 10:30 in the evening. The program starts every day at 10:30 am on weekdays. The bus goes at half past 5 pm. The film starts at 8 o’clock every week. The festival starts on April 15th and closes on May 15th. Ronaldo passes the ball to Benzema. Anthony maintains his lead over the other tennis players. 5. We can use simple present tense when telling stories. Superman opens the door and enters to the room. Suddenly, the window opens and a masket man enters. Go straight along the road and turn left at the corner. Pour the contents into a large container and mix with milk. First of all, break the eggs and whisk with sugar. 7. This tense is also used in ceremonial and formal conversations. I name this ship as ‘Freedom’. I pronounce you man and wife. 8. Newspaper headlines usually are expressed in simple present tense. I will call you before I leave. Teachers will announce when students come to the school. Charles will buy himself a mobile phone after he arrives America. He’ll do it when he come back home. As soon as you push this button the door will open. You will tidy up the room until I come home from the outside. 10. 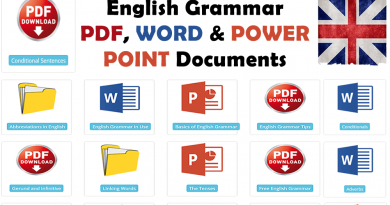 We can also use simple present tense with non- progressive or non-action verbs which do not receive suffix – ing and generally express the situation, emotion, desire, ownership and thought. They do not include action ( like sitting, getting up, running, sleeping, drinking, eating). We can add ‘–ing’ at the end of these verbs if these verbs include action. She doesn’t believe him becuse he always says lies her. I believe that you are innocent. My child needs a bike. This food smells very bad. On Sundays / Mondays, Fridays, etc. 1. If the verbs end with a consonant or a vowel, we generally add just –s at the end of the verbs. 2. If the verbs end with -ss, -x, -sh, -ch, and -o we add -es at the end of the verbs. 3. If Verbs ends with a consonant + ‘–y’, we remove the -y and add –ies at the end of the verbs. Water does not boil At 100degree Celsius if you go to the upper latitude for example on the mountain it boils on the 94 degree Celsius. Oh my! This is quite explanatory! I just feel like a new english student. Thanks. It is very helpful to the beginers… great work… keep it up..